The twenty-first October, 1805 saw one of the landmark battles in naval history. At the moment of his greatest triumph, it also saw the death of Horatio Nelson. It’s the kind of thing people would find hard to believe if you were making a story up, but the truth can be as dramatic as fiction. I had a lovely day out at Greenwich and the National Maritime Museum making sure the details of the battle and Admiral Nelson were as accurate as possible. Through history, it’s interesting to note the times when the great naval powers were different from the most powerful armies. I first remember it from my history lessons about the first Punic War. The Roman legions were masters on land; the Phoenicians from Carthage ruled the waves. There was an impasse until the Romans learned to sail and devised an ingenious means for turning a sea battle into something similar to land-based warfare. Later, in the second Punic War, the great Carthaginian general Hannibal took the fight to the Romans on land. He subjugated most of Italy, but hesitated when it came to sacking the great city of Rome and his moment was lost. When the Romans regrouped they showed Carthage no such mercy. At the start of the nineteenth century, Napoleon was the master of continental Europe but Britain dominated the seas, following Nelson’s victory at the Battle of the Nile in 1798. In 1805 the French attempted an invasion of Britain via Ireland, but were defeated and forced back to Cadiz in southwest Spain. Villeneuve, the French admiral was reluctant to engage the British again, who blockaded him within the port. Finally, under orders from Napoleon, Villeneuve emerged, with a larger fleet of bigger, more powerful ships than Nelson’s. 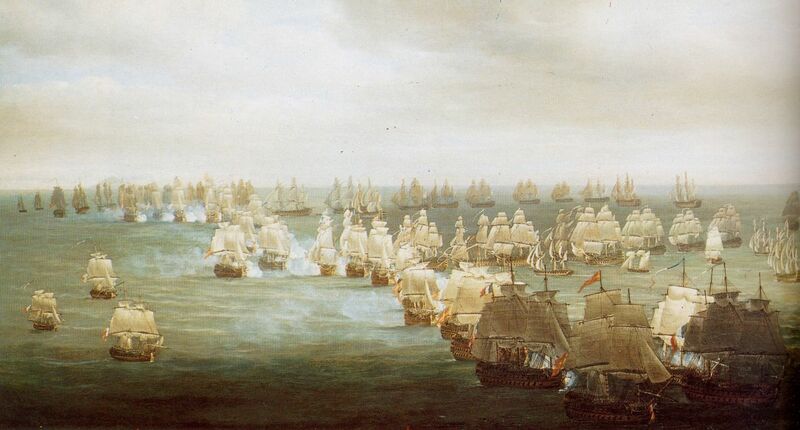 However, Nelson rewrote the rules of naval warfare, cutting through the combined French and Spanish lines rather than sailing parallel to them. While twenty-two of Villeneuve’s ships were taken or sunk, no British vessels were lost. Tomorrow, there’s a picture of a completely different type of sailing ship. For day five of Johnny Mackintosh, I’m giving you an amazing photo from the Hubble Space Telescope. My hope is that it shows the enigmatic star, Eta Carinae and the Keyhole Nebula, all embedded within the wider Carina Nebula. Sadly I’m forced to confess that, unlike Johnny, I haven’t seen it close to so am not quite sure what’s meant to be where! The Hubble Heritage Team has a separate labelled map that looks a little different, so you might try to superimpose one over the other. The Ancient Greeks called the stars “fixed” (while the word planet means “wanderer”), but the heavens aren’t always as unchanging as they believed. Eta Carinae is classed as a hypergiant, about the biggest star there is – around a hundred times bigger than our own Sun. Its behaviour is unusual for how quickly it changes . We should be grateful that astronomers have left meticulous records of their observations for hundreds of years. In 1677, Edmund Halley (who the comet is named after) classified Eta Carinae as “fourth magnitude”. Fifty years on, astronomers were surprised to record it as much brighter than this – perhaps Halley had made a mistake? Yet, over the next fifty years, the star dimmed back down to where Halley had categorized it. 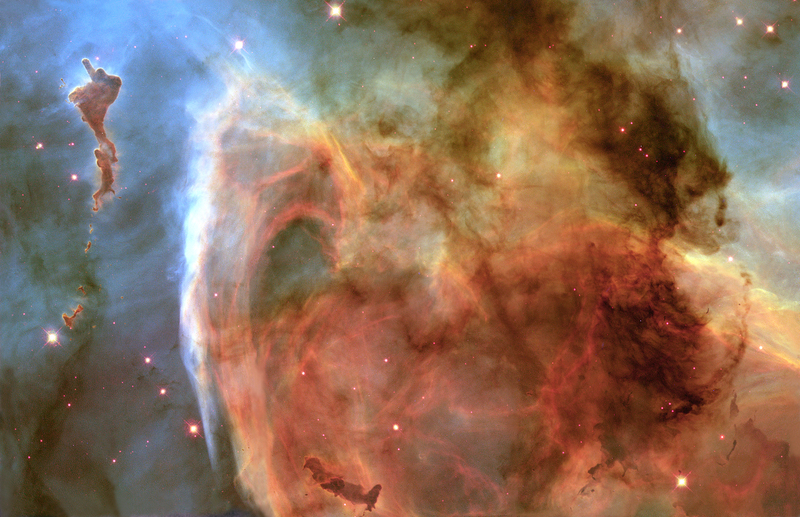 Then, in the early 1840s, Eta Carina flared suddenly to become the second brightest star in the sky after Sirius, despite being a thousand times further away – scientists wondered if they were watching a supernova, the great explosion when a star tears itself apart. Yet the star remains in place. It quickly faded and by the start of the twentieth century had become invisible to the naked eye. Late in 1997 Eta Carinae brightened again, so we can now see it without the aid of telescopes. There are only a very few stars in all the Milky Way of comparable size and there’s a rule – the bigger the star, the faster it burns its fuel. This means there’s a chance this giant is near the very end of its life, so we think it is one of the best candidates for a supernova in our galaxy in the near future. Tomorrow we’re travelling back in time, to the early nineteenth century. It’s one of my favourite sections of the book. We’re a third of the way through the twelve days of Johnny Mackintosh and hitting the meat of the story – far more appetizing than those cold turkey sandwiches you’ve been eating. When my editor suggested “star blaze” to me for a title, this is the image that instantly sprang to mind. For me it simply oozes astonishing power and energy. Even though space is a vacuum that sound wave can’t cross, when I look at this I imagine a deep rumble that hasn’t stopped for five billion years and won’t for another five billion – all being well. This raging furnace is our Sun. There’s a huge solar flare shooting out from the bottom left-hand corner. 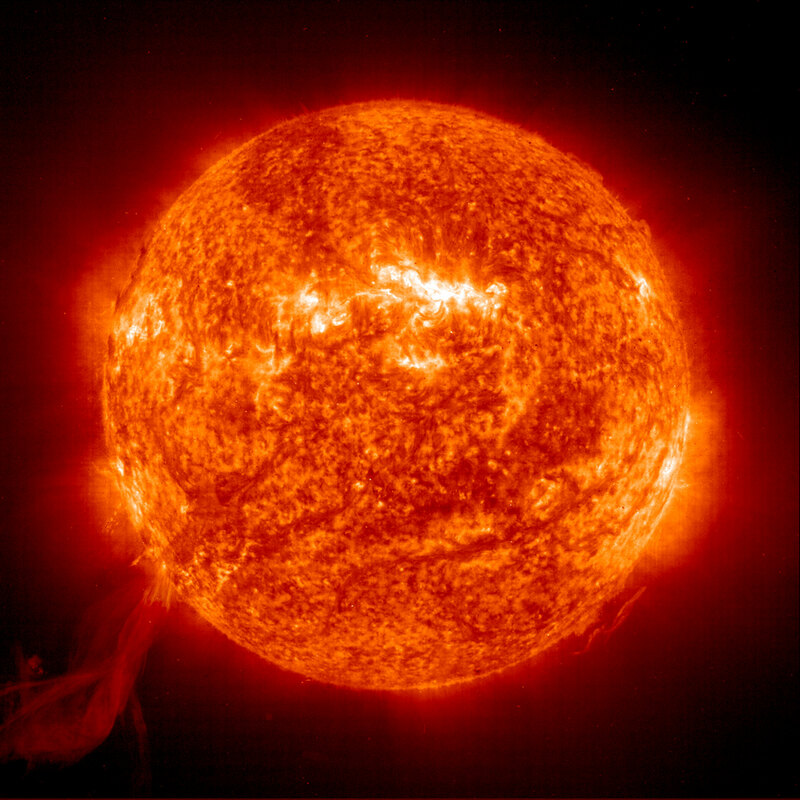 The Sun has an eleven year heartbeat, that we don’t understand but which means that the magnetic activity on its surface goes through eleven year cycles. In two to three years we’ll reach a maximum where big flares such as this will be more common, the aurora (the Northern and Southern Lights) will be become more spectacular and visible to more people and there may be times when your mobile phone stops working because of the effect on satellites in orbit. What this picture reminds me of is the incredible power of nature – of the awesome star blaze. It’s the third day of Johnny Mackintosh. If I had countless millions of pounds, I would spend around £15m of them on a trip to the International Space Station. Several people have done this and Charles Simonyi has even been twice. He donated money to Oxford University where I work so we could have a Professor for the Public Understanding of Science. For a while this was Rickard Dawkins who wrote The Selfish Gene and The God Delusion. Nowadays it’s the mathematician Marcus du Sautoy. I went to his inaugural lecture in November and we chatted about football and space afterwards, making me think that Marcus would probably like Johnny Mackintosh. The ISS is in what we call low Earth orbit, at an altitude of around 340 km (that’s just over 200 miles). When I was growing up, for a while the Americans had Skylab and then the Russians broke all sorts of records with Mir. From space, Earth has no borders and it’s great that a cooperative, international approach is being taken to much space exploration. 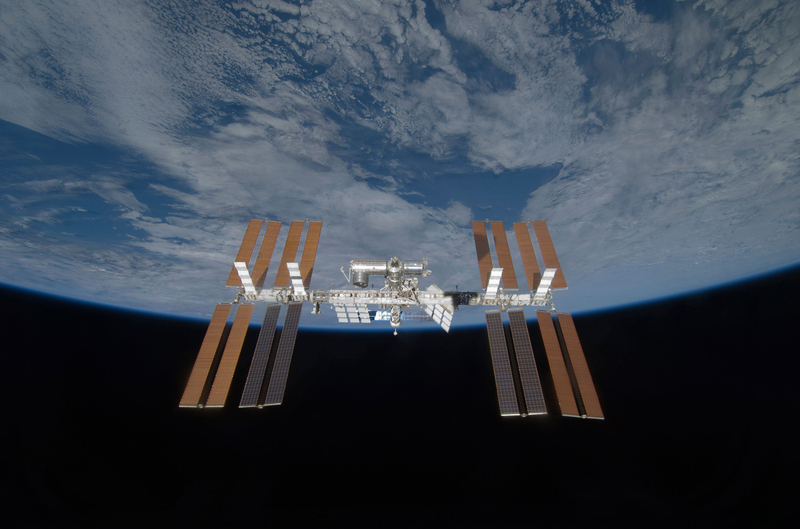 If you want to see the space station, as it crosses the night sky, it’s easy. NASA have an applet at their Human Space Flight website which will tell you when the ISS will be visible, wherever you are in the world. Tomorrow we’re off to the very heart of the solar system. Welcome to the second day of Johnny Mackintosh. 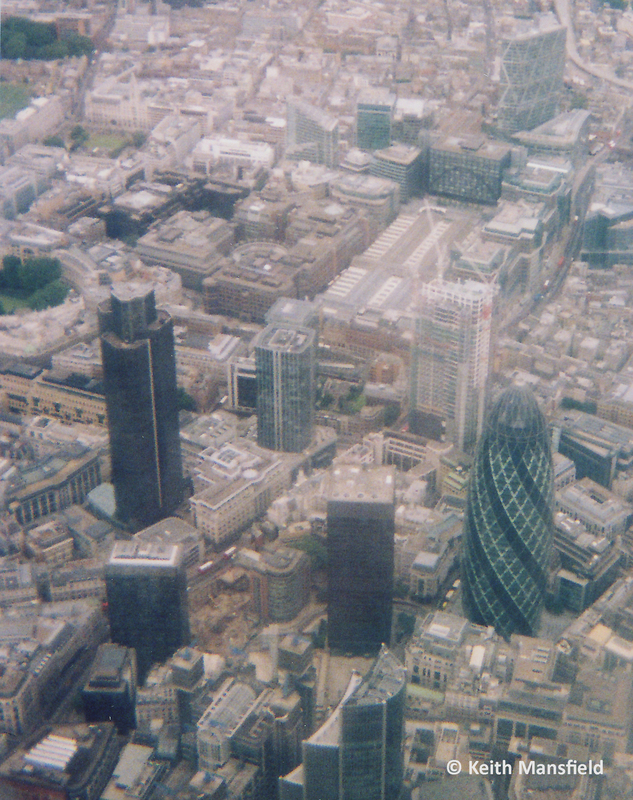 I took this shot with a disposable camera flying into London City Airport. Even though the photo doesn’t do it justice, I’ve cropped it to include the Bishopsgate Tower (a new skyscraper at the very top of the picture) which, from many vantage points on the ground, looks curiously two-dimensional. 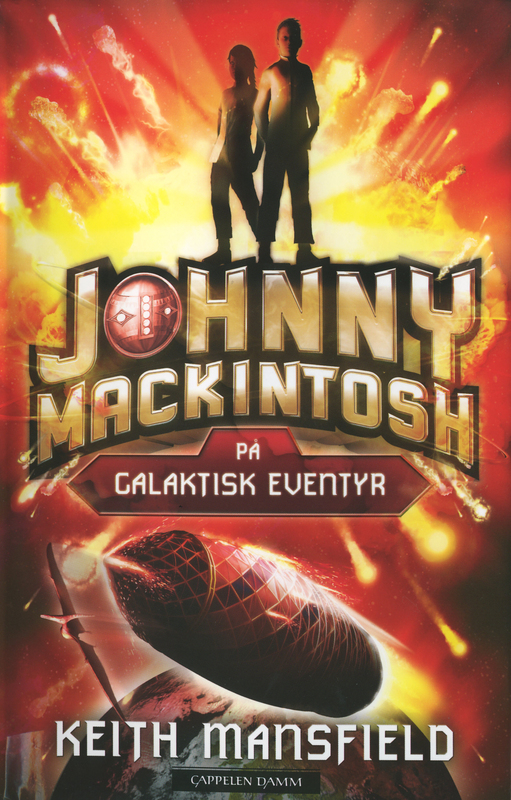 When I was writing Johnny Mackintosh: Star Blaze, I’d often work long into the night, say until three or four in the morning. Bishopsgate Tower was being built at the time and glancing up from my notebook I’d see the lights from welder’s torches sparkling in different places through the dark. Of course the best thing about the photo is the great view of the Spirit of London (I made sure I snapped this when Johnny and Clara were here on Earth, so the original London Gherkin has been folded away into hyperspace and what you’re seeing is Johnny’s actual spaceship). She is magnificent and doesn’t look out of place anywhere in the galaxy. Now we’re two days after Christmas I’d suggest getting to work on those thank you letters so you’ve plenty of time for reading once Star Blaze comes out. Tomorrow, we’ve back in space but very, very nearby. Happy Christmas to fans of Johnny Mackintosh everywhere! I hope you had a great time. 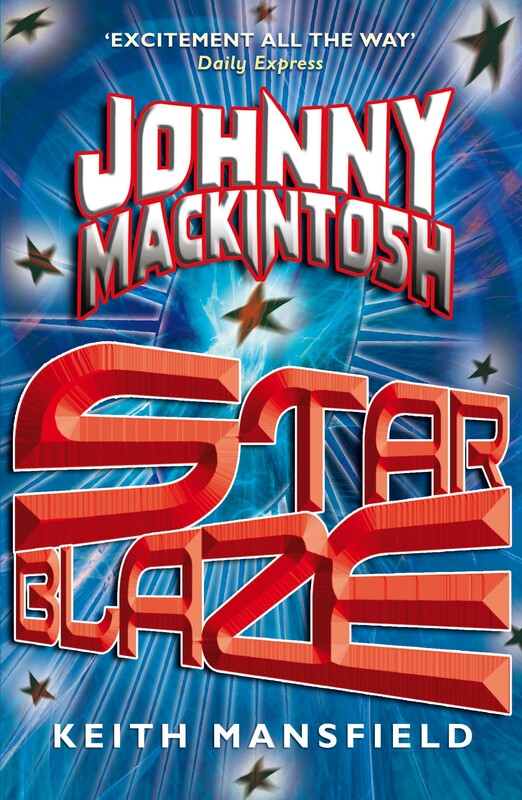 For the next twelve days, leading up to publication, I’m going to be posting images that give what I hope is a tantalizing taste of Johnny Mackintosh: Star Blaze, showing places Johnny visits, but not giving the story away. 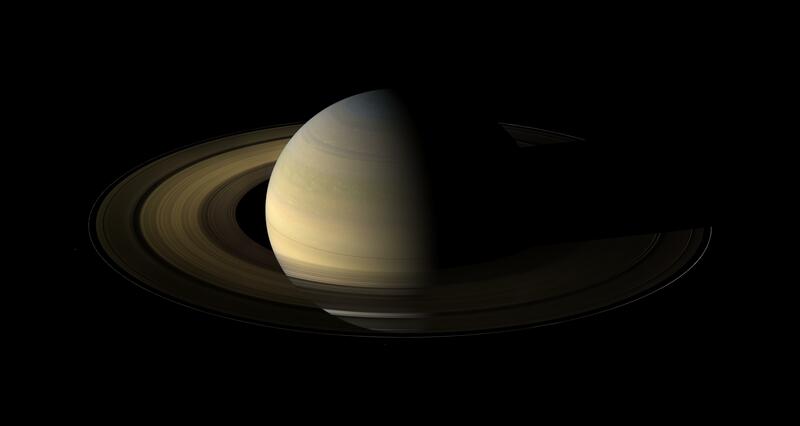 Today’s first image shows the planet Saturn. If I had a spaceship, the first place I would visit would be Saturn. End of. Ever since I was young it’s the sight I’ve most dreamed of seeing close at hand with the naked eye. Perhaps, in a couple of hundred years’ time, there’ll be a thriving tourist industry and plenty of space hotels in orbit. All four of the gas giant planets in the solar system turn out to have ring systems but the others pale when compared with the mighty Saturn, whose rings can sometimes be seen through small telescopes from Earth. We don’t know for certain how and why they formed and how long they’ll last. A few years ago opinion among astronomers was that they were a temporary phenomenon. Nowadays, it’s thought more likely the rings are stable and could even last as long as Saturn or the rest of the solar system. As Johnny Mackintosh: Star Blaze begins, the Spirit of London is close to Saturn. This picture was taken by the Cassini spacecraft, and this particular shot is of an equinox, where the planet is exactly half in light and half in shadow. We’re used to the myriad satellites orbiting Earth, for instance giving us TV, mobile phones and weather forecasting, but it’s amazing to think that nowadays we have satellites in orbit around other bodies. There are three around Mars and it’s a tremendous achievement for Cassini to have been positioned around Saturn as it has.